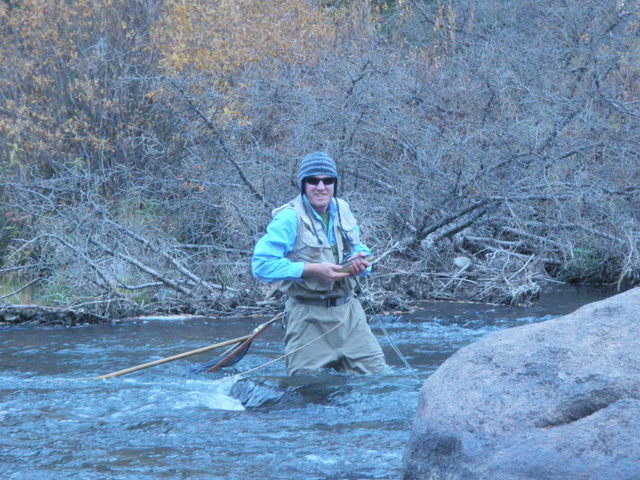 After a rough outing on Wednesday I was anxious to find another opportunity to test the Colorado waters before hanging up my waders for the winter excepting of course the scheduled trip to Argentina in December. The weather forecast appeared to be favorable for Saturday and Sunday, so I chose Sunday as the day to make a late October fishing trip. The flows on South Boulder Creek were 95 and I can reach the water below Gross Reservoir in an hour and the stream supports a large population of rainbows who are not fall spawners, so this became my choice for Sunday. I left the house a bit after 10AM and arrived at the parking lot shortly after 11. The lot was almost full, and I had to park next to the picnic table in the northeast corner. It was a pleasant day with air temperatures probably reaching the mid to high 60’s as I packed my lunch in my backpack along with my raincoat and assembled my Loomis 5 weight and began the hike down the path at roughly 11:20. I decided to hike beyond my furthest point to date and succeeded in this endeavor. By the time I tied on my Chernobyl ant with a trailing beadhead hares ear it was noon. I extended the tippet section that was tied to the bend of the Chernobyl to roughly three feet as I wanted to get deeper in the higher flows. The Chernobyl/hares ear combination did not produce through some choice water so I clipped off the beadhead hares ear and added a beadhead Craven soft hackle emerger. Finally after fifteen minutes or so of additional fishing, a decent rainbow grabbed the BWO imitation at the tail of a deep run. Shortly after this, a small brown darted to the surface and snatched the Chernobyl ant. However, after this welcome success in the first hour, I began to experience refusals to the Chernobyl with no attention paid to the trailer, so I clipped off both flies and substituted a gray comparadun. This fly worked well for me in previous trips and the fly shop report suggested PMD’s and green drakes were still hatching. I approached a nice pool with three current seams feeding the top and spotted a couple rises where the current fanned into the pool. I tossed the comparadun to the top and a nice brown tipped up and inhaled the mayfly imitation. Perhaps I’d chanced upon the winning fly for South Boulder Creek. Unfortunately this appeared to be a fluke because fish continued to rise in the riffled current at the top right of the pool, and they paid no attention to my offering. I studied the surface closely and spied two mayflies lifting off, but they were much smaller than a PMD and likely BWO’s so I switched to a CDC BWO. Unfortunately after a couple drifts, I tried to loop a cast above and to the right of a protruding dead branch, and as I picked up my line, the tiny fly lodged in the end of the branch. The only way to save the fly was to wade over and disturb the pool and the CDC fibers were now saturated and required drying and fluffing. I moved on above this area, but I didn’t see any more rising fish nor did I see anymore BWO’s. What I did see however were small stone flies riding the surface and dapping and fluttering up from the stream. I managed to swipe one with my net and inspected it at close range. It was a size 18 body of dark brown-olive with smokey dark gray wings and black legs. The wings were almost twice the length of the body and I looked in my fly patch and fly boxes and found two size 16 dark olive caddis with undersized hackles, so I removed the one from my fly box and tied it to my line. I began prospecting with the caddis in hopes that it would be a close enough imitation of the stoneflies and It was about this time that I approached a very attractive long riffle stretch. The area was roughly 25 feet wide and 30 feet long and I flicked some casts to the lower portion and below some overhanging branches. It didn’t require more than a cast or two and a small rainbow smashed the caddis, now stonefly imitation. I fanned some casts to the left and then covered the middle area and the top and landed six more fish on the stonefly in this area and in some nice water above the riffle area. The teeth of one of the browns broke the hackle stem so I clipped it off and fished the fly with only a wing and body and no hackle. This almost worked better than the hackled version as I landed several of the fish on this fly. One fish took the fly fairly deeply indicating that it didn’t suspect that it wasn’t a real stonefly. Unfortunately as I moved along, the stonefly activity waned and I went through a slow spell, but around 3PM I began to notice legitimate BWO’s and rising fish. In a pool with some steady risers I decided to clip off the caddis and replace with a size 22 CDC BWO and this did the trick for the next 45 minutes as I landed three additional fish. If I could spot a rise and put myself in a position where the sun glare wasn’t too bad, I could dupe the fish with my tiny imitation. One of the nicer fish sucked in the CDC BWO just as it sank below the surface. Once again however the hatch slowed and disappeared and the shadows began to extend over much of the stream. I exited at this point and hiked up the path looking for stretches of water that remained in the sun. I did manage to find several of these areas and as the lighting was now quite difficult, I abandoned the size 22 CDC BWO and tied on the other size 16 olive brown deer hair caddis. 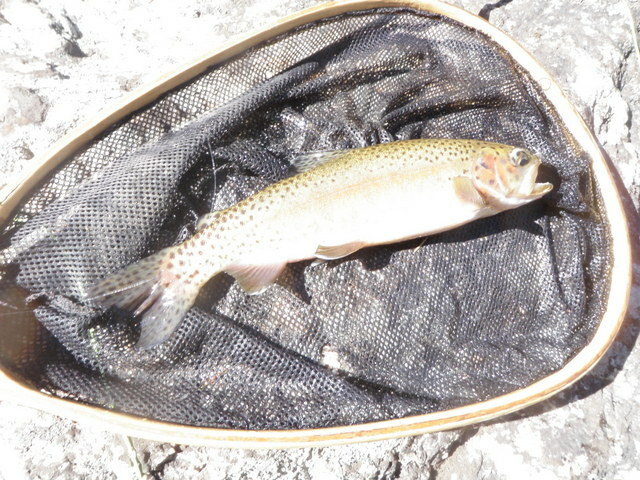 Over the remaining hour I picked up four more small trout on the caddis by fishing in sunlit areas. By 4:30 the entire canyon was covered with shadows although the temperature remained quite conducive to fishing, but I decided to hike back out and return home as I was already running late compared to the return time I’d communicated to Jane. I was quite pleased to land sixteen fish on October 21 with nearly all taking flies on the surface, and I resolved to tie some size 18 stonefly imitations so I’m prepared for the next visit. I’ve concluded that South Boulder Creek is one of the few streams in Colorado where large attractor style flies do not perform. These educated trout seem to prefer offerings on the small side and flies that actually come close to imitating the real food that they see on a day to day basis. Go figure. Normally these fishing reports are about catching fish, but my experience on October 17 was more about overcoming difficult obstacles to experience a day of fishing. Dan called on Sunday and asked if I was interested in going fishing if he took a day off. He indicated that Tuesday and Wednesday were his best options, but he preferred Wednesday so we made tentative plans. 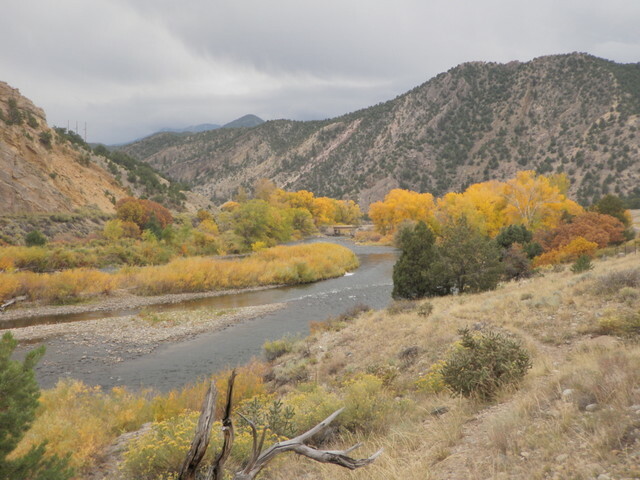 I suggested hiking into Wildcat Canyon to fish the South Platte River as we enjoyed some decent fishing in 2010 and 2011 during October on this stream. As Wednesday approached I frequently checked the streamflows and weather, and the flows of 124 were reasonable and actually favorable since they were higher than our trip in September when the fish were a bit skittish, but lower than my trip in August when it was difficult to cross the river. Unfortunately I couldn’t say the same thing about the weather as highs were forecast to be mid-50’s and lows around freezing. I fished the Arkansas River the previous Friday with a high of 57 and steady rain, so I felt these temperatures were tolerable. We hoped to eliminate the two plus hour drive on Wednesday morning by camping at Happy Meadows Campground near the trailhead on Tuesday night, so I was a bit concerned about the low temperature. Dan arrived at my house by 7PM on Tuesday and we made the drive and watched the thermometer drop as we traveled south through Colorado Springs and then west over Ute Pass. By the time we reached the campground the air temperature was 45 degrees and there was one other camper at Happy Meadows. Dan and I put up the tent but didn’t stake out the rain fly as there was minimal chance of rain. Dan had his down sleeping bag as well as a second sleeping bag and a small quilt. I had my down sleeping bag and two thick quilts. We put one quilt on the floor of the tent, then placed our pads on top of that, and then our sleeping bags, and then in my case a thick blue quilt was used as a top layer. We climbed into our cozy quarters by 10:30 and within a half hour I felt a mist hitting my face. Much to our surprise it rained briefly and I had neglected to zip the rain fly. Once I zipped it down, I no longer felt moisture, but I fell asleep to the sound of the light pitter patter of rain hitting the tent. The factor we had not anticipated was the strong wind that blasted the tent all night long. Since the rain fly was not staked to the ground it continually slapped against the side of the tent, and several times I awoke as the tent itself was pushed relentlessly down against my face from the force of the wind. I placed my flip flops on the ground outside my tent door in case I needed to get up during the night, and when I looked for them in the morning, only one was where I left it and the other was forty feet away near the pay station. Dan found some ice on the tent so apparently the temperature had dropped below freezing, although I was quite comfortable in our cozy tent from a temperature perspective. As we threw all our layers back in the car and prepared a light breakfast using Dan’s backpacking stove the wind continued to howl and I checked the temperature at 9:30 and it was 42 degrees. Evindently a cold front had blown in during the night, and the high of 55 degrees was looking optimistic. After breakfast we stuffed our backpacks and I put on my waders and wading boots and we drove a mile or two to the trailhead. Fortunately I removed all my top layers except for my long sleeved undershirt and fishing shirt for the three mile hike as we generated quite a bit of body heat. When we reached the river it was flowing higher than September but clear and we were encouraged and hoping for another decent late fall day of fishing. I was a bit concerned about the wind and I’ve never done well the day after a cold front arrives, but we planned to overcome these concerns. We deposited our packs at the campsite that we used in September and assembled our rods and then hiked further down the path to a point where the canyon narrows and the velocity of the water increases. 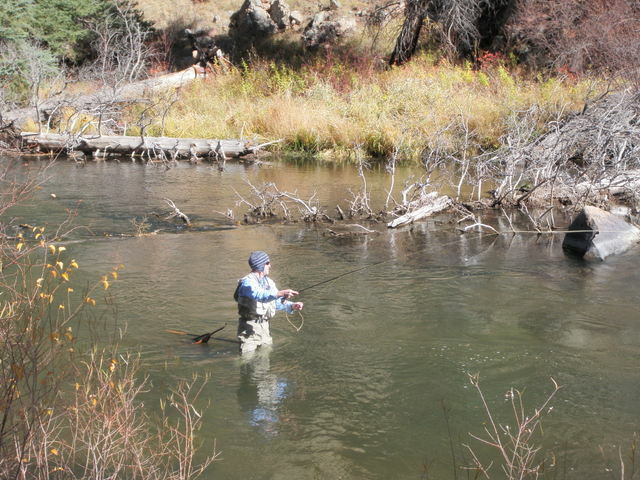 Here we cut over to the river and while Dan tied on his flies, I began casting along the bank closest to the path. I covered twenty yards of water while Dan knotted on a Charlie Boy hopper and beadhead hares ear. After twenty yards we reached a spot where the river became wider and Dan could wade to the far bank. I began fishing with a gray parachute hopper trailing a beadhead hares ear, but it didn’t take long for me to realize that the fishing was going to be difficult compared to my previous trips in 2012. I was casting to water that yielded nice brown trout during my earlier visits, but during the first half hour these drifts were producing nothing but arm exercise. The same was true of Dan’s casts along the far side of the river. As I moved upstream I reached a point where a small side channel of water merged with the main river. As I gazed at the junction I spotted several fish moving in the shallow water with their upper fins out of the water. It became pretty clear what was going on; three or four browns were in spawning mode. This probably explained the absence of browns from the lies that had produced fish in August and September. I continued upstream and after 45 minutes or so my hopper dipped at the tail of a run in front of a large submerged rock and I set the hook and played an eleven inch rainbow in to my net. 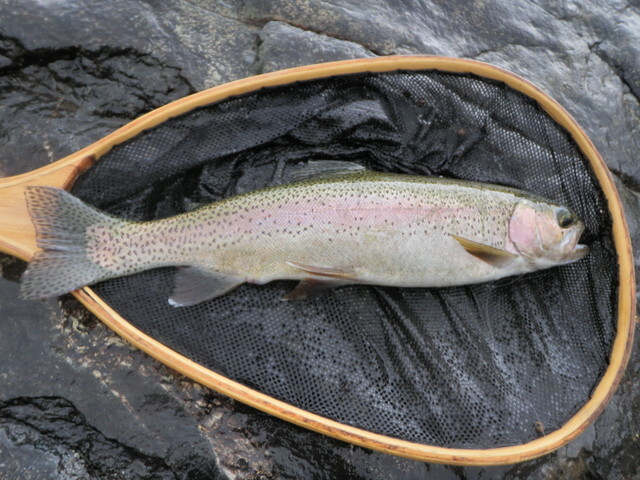 In short order I landed a second rainbow that was a bit larger on the beadhead hares ear. Meanwhile Dan finally connected on a brown along the opposite bank. The wind continued to blast down the valley and our hands began to ache after releasing fish due to the cooling effect of evaporation. At 1:15 I suggested that we take a break, return to our base camp, eat our lunches and warm our hands. After lunch I decided to change my approach and rigged my line in the manner demonstrated by Taylor Edrington of Royal Gorge Anglers. This involved a thingamabobber, and four foot section of 3X, a split shot, a twenty incher as my top fly, and a beadhead hares ear as my point fly. Dan continued fishing with the hopper/dropper combination that he used in the morning. We hiked back down the path to the area where we had finished as there was a long pool that I wanted to run the nymphs through. Unfortunately the change in method didn’t really improve my fortunes to any great degree. 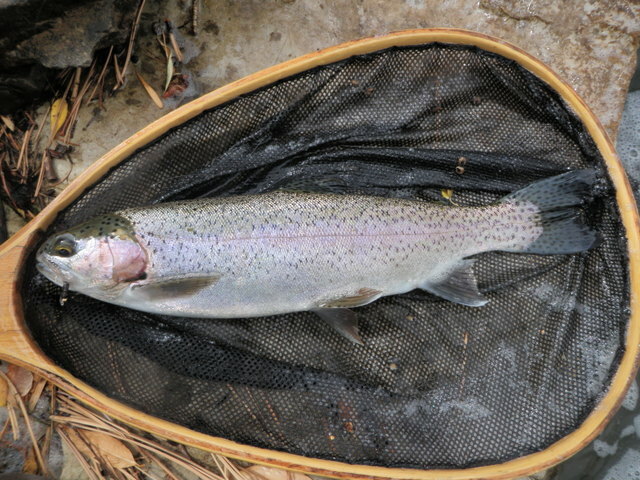 Over the remaining two hours of fishing I worked the nymphs through some juicy deep runs and pools and landed one more rainbow. After a half hour or so I noticed some tiny mayflies floating on the surface and fluttering up into the air, so I swapped the hares ear for a beadhead Craven soft hackle emerger. I should point out that I had four or five momentary hook ups in the afternoon that I did not land. I’m guessing these fish were taking the soft hackle emerger, but for some reason I wasn’t doing very well with setting the size 22 hook in a manner that allowed me to net the fish. 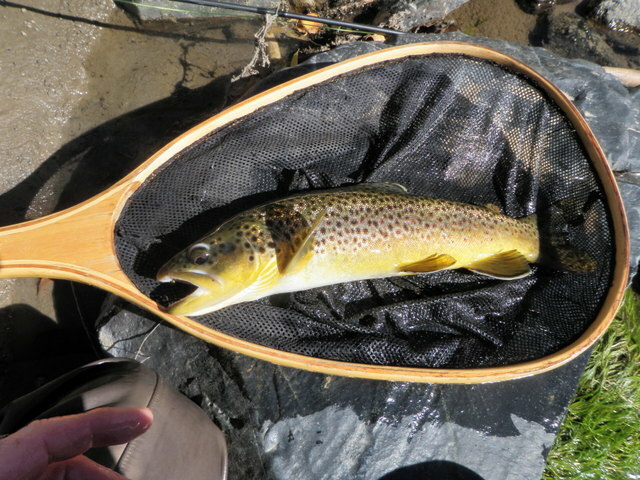 Dan meanwhile landed a nice brown trout in excess of 12 inches on a beadhead pheasant tail at around 3PM. He converted from the Charlie Boy hopper to a Chernobyl ant and trailed the beadhead pheasant tail and soft hackle emerger. 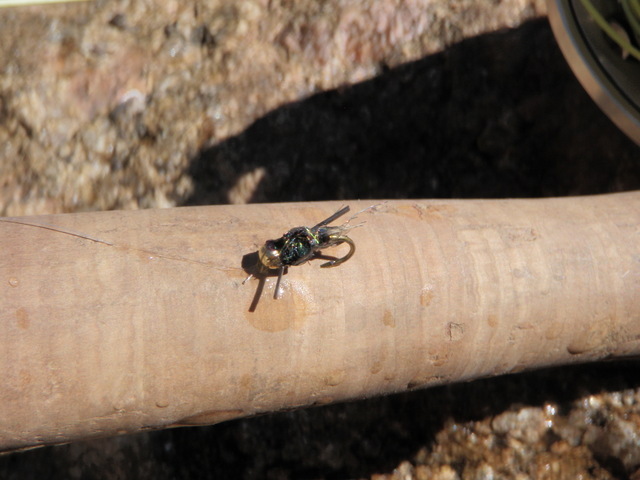 I was impressed with his willingness to fish three flies in the cold windy environment. Just before we quit for the day he landed a small brown. By 4PM the shadows covered most of the water and the air temperature was plummeting, and combined with the consistently annoying wind created quite a bit of fishing hardship, so we decided to pack things up for the day. We stuffed our packs with our gear and made the three mile return hike in an hour. Once we stowed everything in the car, we fired up the heater and turned on the heated seats and pulled out the snacks. We stopped at Front Range BBQ in Old Colorado City on the outskirts of Colorado Springs for a warm enjoyable dinner. 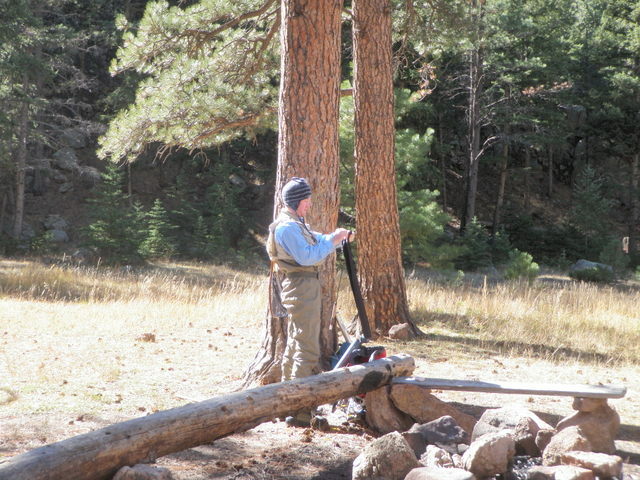 The fishing was difficult on October 17, but we took pride in camping during sub-freezing temperatures and overcoming the wind and cold to catch a few fish. Wildcat Canyon was as always a beautiful place to be with no other human beings to interfere with our enjoyment of the gorgeous Colorado outdoor environment. Clearly the season was waning and I was anxious to make a few more productive fishing trips before settling into fly tying mode. 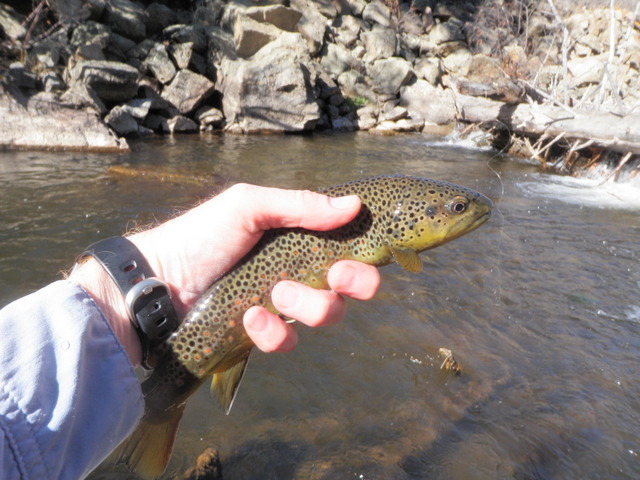 The Arkansas River reports indicated strong BWO hatches on overcast days and Friday’s weather was shaping up to be ideal BWO conditions so I made the nearly three hour trip. I decided to move downstream from my previous two visits for variety and to try new water. I parked at lunch rock, a massive rock that juts into the river and creates a huge eddy just beyond the large bend in the highway above the Wellsville bridge. 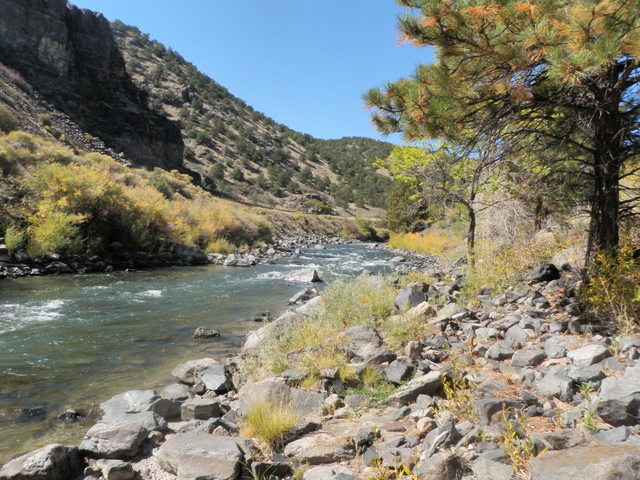 This spot was a favorite of mine when I first moved to Colorado and began tossing flies on the Arkansas River, but in recent years I gravitated to the juicy water a bit further upstream. The car temperature registered in the mid-40’s as I dressed for fishing so I pulled on four layers including my raincoat and ski hat in preparation for a day on the river. My weather app on the iPhone forecast high temperatures of 59 with a high chance of afternoon showers and thunderstorms. I planned to start with the new nymphing rig introduced to Dave Gaboury and me on our guided fishing trip and then switch to the familiar tapered leader setup if a decent BWO hatch developed so I chose my Sage 9 ft., 4 weight rod because it is long and stiff and works well for casting nymph rigs. I assembled the four piece rod, but decided to wait until I was by the river to convert from the tapered leader to the nymph rig. As I walked downstream along the shoulder of the highway toward the Wellsville bridge I noticed some dark gray clouds gathering in the southeastern sky, but didn’t get too concerned as rain wasn’t supposed to arrive until noon, and I was on track to be on the water by 10AM. I found a place where the top wire of the barbed wire fence had been removed and it was obvious fishermen accessed the river, so I carefully climbed over and then slowly maneuvered my way down the steep bank to the river. I reached the river where it split around a small island and the character was shallow riffles on both branches so I crossed the wide shallow flow and then climbed the steep bank on the eastern side and worked my way upstream to the head of a beautiful long deep pool. As I sat on a large rock and removed my tapered leader and coiled it on to a blank tippet spool that I kept in my front pack for this purpose, I heard the rumbling of distant thunder. I was about to pull out the 0X tippet spool I’d purchased to connect the end of the fly line to the thingamabobber, when I noticed several flashes of lightning followed briefly by thunder. This unnerved me, and I didn’t want to be caught this far from my car in the event of an intense thunderstorm, so I retraced my steps and made the long loop back along the bank, crossed the river carefully at the top of the island again, and then hiked back along the right shoulder of the road. By the time I reached the car the lightening and thunder had subsided, but it was raining moderately hard, so I opened the hatch and finished rigging my line with the shelter of the car at my disposal. I cut a 9 inch section of heavy monofilament and tied a loop on the one end and then executed a loop to loop connection with the end of the fly line. I used a clinch knot to connect the thingamabobber to the end of the 9 inch section which was now reduced to 6 inches due to the knot tying on both ends. Next I uncoiled four feet of 3X and tied that through the same opening on the thingamabobber and then connected a section of 5X to the end of the 3X and crimped a split shot above the surgeon’s knot. It was now time to choose a fly. I wanted to use a 20 incher to duplicate Taylor’s setup, but I only had one that I purchased at RGA, and I wanted to keep that for a model for tying some myself, so I used a beadhead prince in a size 12. Next I used a clinch knot to tie another section of 5X through the eye of the prince and a foot or so below the top fly, I tied on a Craven soft hackle emerger with no bead. I was ready to go and decided not to make the long loop again, so I descended to the river below lunch rock and then hiked a path down along the river. I ended up just above the spot where I initially intended to begin but on the side of the river bordering the road, and it was now 11AM when I finally began to cast. The first long deep run and pool didn’t produce any fish, but the next spot had a strong fast deep run within ten feet of the bank I was on. I began casting directly upstream to the water between the current seam and the bank and it wasn’t long before the indicator dipped and set the hook and played a nice chunky brown with the prince nymph in its lip. With all the rigging steps, I’d forgotten to crimp the barb on the prince and I had to work the fly at length with the fish in the water to finally remove the fly. In the process of applying pressure to the fly, the two white biot wings fell out and I now had a minimal beadhead nymph with tails and a peacock body. I decided to stick with the handicapped fly and the fish didn’t seem to care about the lack of wings, and in fact the fly without wings looked more similar to a 20 incher. I moved to the top of the narrow corridor of productive water and added two quite nice browns that attacked the Craven soft hackle emerger on the lift, and I was quite pleased with the early action. 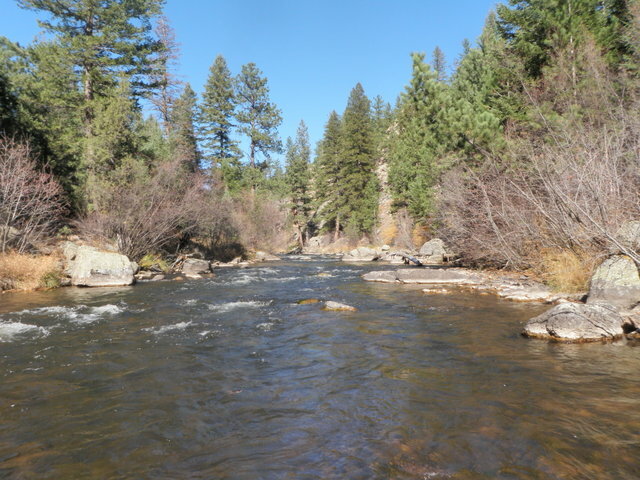 As I progressed back up to lunch rock I landed a smaller brown on the maimed prince and another nice brown on the soft hackle reaching five fish landed and I arrived at the Santa Fe by noon. By now the rain had stopped but my hands were quite chilled from being wet and the cooling effect of evaporation, so I decided to return to the car to eat lunch even though I’d stashed it in my backpack for eating by the river. I sat in the driver’s seat and ran the heater and turned on the heated seat while munching my lunch. The dashboard thermometer registered 57 degrees, but it certainly felt colder than that to me. 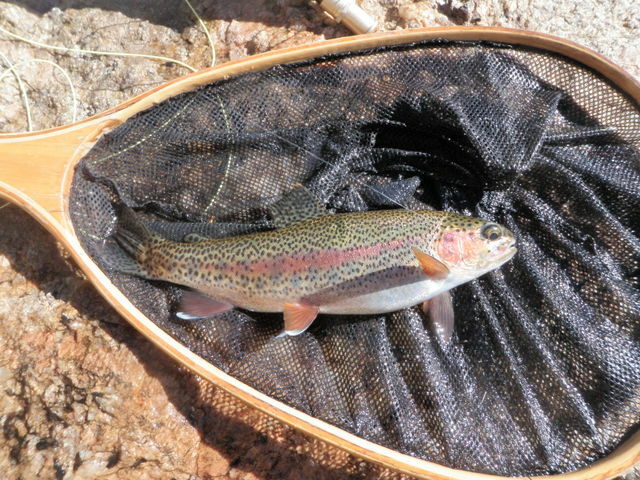 After lunch I resumed my search for fish by beginning in a beautiful deep run above lunch rock, and here I hooked and landed a hot rainbow that forced me to negotiate my way down the steep path from the high rock while playing the fish. This fish also took the prince so I’d now landed an equal number on each fly. Since I was now on the bank directly across from the deep run, I made some casts across and let the nymphs drift down into the sweet spot at the base of the run, and had two momentary hookups. I moved on and worked the pockets and runs along the left bank right next to the road and increased my fish count from six to ten before reaching the tail of a beautiful long smooth pool. From head to tail the pool was probably 30 or 40 yards, and I decided to cross at the shallow tail and work up the bank away from the highway. At this point the sky to the west had become quite dark and clearly more rain was imminent, but I didn’t hear thunder, so I decided to gamble and make the crossing. I was already prepared with my raincoat on and the hood was pulled up over my stocking hat. I skipped the lower smooth section of the pool and moved to the midsection where there were a lot of large submerged boulders, and it looked like dynamite brown trout water. 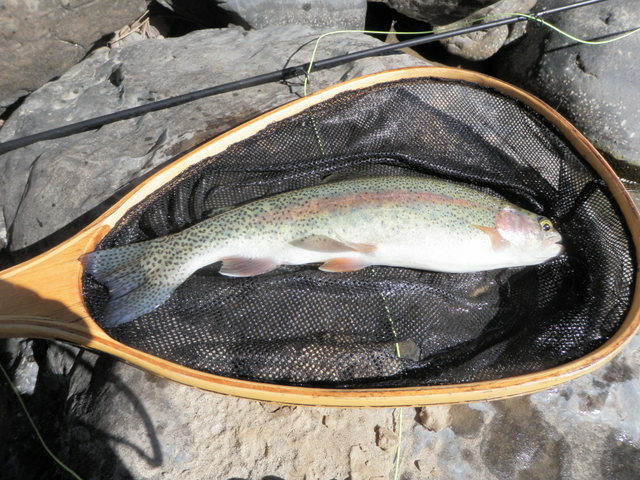 As I began casting my flies upstream and across and dead drifting them with a nice swing below me I noticed a nice rainbow eight feet in front of me in front of one of the large submerged boulders. As I watched, the rainbow was clearly feeding on something subsurface and actually rose and sipped something once or twice. I didn’t want to go through the hassle of switching my entire rig to the tapered leader to fish a dry, so I cast upstream and attempted to execute a swing in front of the fish. On perhaps my fifth attempt as I lifted my rod to swing the flies in front of the fish, it moved a foot to its right and chomped on the prince. The fight was on and the rainbow ripped line and made several streaks downstream and up before I could pressure it to the side and scoop it in my net. By now the rain had begun and it was coming down harder than at any other point in the day. These were perfect BWO conditions, but other than my ability to catch quite a few fish on the size 22 Craven soft hackle emerger, there was no evidence that BWO’s existed on the Arkansas River. 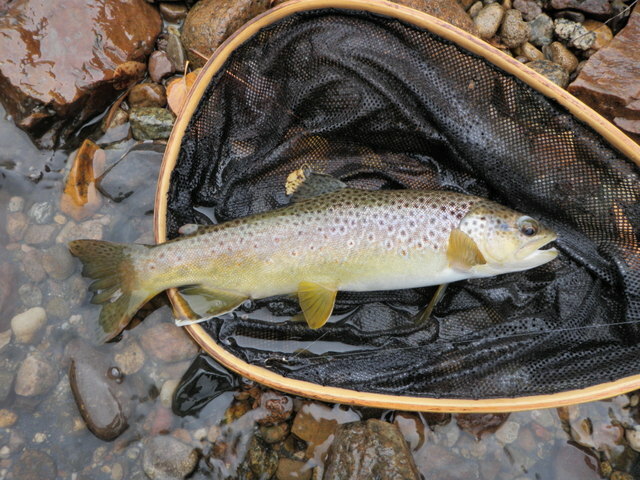 I managed to land a medium sized brown in the riffles at the head of the long pool and had two or three momentary hook ups in spite of using the down and across hook set taught by my guide, Taylor. I waded further upstream along the bank prospecting with the nymphs and spotted a rise in front of an exposed rock. I attempted to execute the same swing technique, and sure enough five to eight feet above the rise, I felt some weight on the lift and set the hook. This action resulted in a fifteen plus inch brown leaping from the water which exposed the entire fish. Unfortunately it dove and somehow went under a stick and came free. Shortly thereafter I hooked another hot fish that streaked upstream and shook off the hook after a brief dash, but then I covered quite a bit of water with no additional action until I came to an interesting area with large high vertical rocks coming down to the water. As I gazed upstream and peered through the moderate rain I noticed another crazy fisherman waded waist deep into the run from the highway side of the river, and he was similarly hunched over in his rain jacket and hood. I didn’t feel like climbing the rocks and circling around and above him, so I turned around and retreated with the intent of calling it a day; however, when I came next to the top of the head of the long pool, I decided to make some more casts to the area where I’d had several momentary hookups on the downstream swing. Sure enough on a long cast across to the current seam and on a downstream drift, the indicator paused and I set the hook with a down and across the chest sweep and hooked and landed a small brown. The rain was now waning a bit and small patches of blue were appearing in the western sky. As I began casting again, I observed several rises downstream and below me, and then two more fish created some rings, so I decided to make the conversion to dries. I sat down on a rock in the continuing light rain and began the process of clipping off flies, tippet and thingamabobber, and unfortunately this process consumed around 15 minutes which probably represented 50% of the total elapsed surface fishing time. Finally I was ready and tied a size 22 CDC BWO to the end of my line and began to cast across and allow the fly to drift downstream to the fish rising in front of an exposed boulder. I was having great difficulty following my tiny tuft of a fly in the overcast dim light, but the fish continued to rise but not take my fly. Eventually I reeled up and replaced my fly with an even smaller size 24 CDC BWO. Because of the rain the CDC wings were already wet before I cast, so I had to spend time drying and fluffing. As this was going on the sky was gradually getting brighter and I could see my tiny speck of a fly when the wing was fluffed out. After four or five casts with the size 24, I placed one just above the rock and a small brown rose and sipped it in. Meanwhile several move fish continued to rise downstream 10 yards or so in a current seam that flowed around another exposed boulder. I waded to the bank and moved down a bit so I was above the fish rising closest to me. After a few unsuccessful casts and downstream drifts, this fish also inhaled my offering, and this time I landed an eleven inch brown. Unfortunately after releasing this fish as I dried and fluffed the fly the sun came out and the fish discontinued their feeding. I decided to wade across at the tail and observe the area along the bank next to the road where I’d seen some rises while reconfiguring my line. I paused at the tail of the pool and looked upstream and observed for five minutes or so, but nothing was showing so I climbed the bank and returned to the car. Shadows were now covering half the river and the temperature dived as the sun sank lower in the sky. My sleeves were wet from the rain trickling down my arms as I cast and as I worked on my rigging so I was feeling quite chilled and my hands were stiff and curled. I decided to abandon efforts to catch more fish at 4PM and made the three hour drive back to Denver in time to have dinner with Jane. It was a nice day on the Arkansas as I deployed the new nymphing rig and landed quite a few chunky fish in the 12-15 inch range. The Craven soft hackle continued to perform and I rediscovered some new water. I managed to weather quite a bit of rain and remained relatively dry. I didn’t succeed in enjoying extended BWO surface fishing, but did manage to pick up a few fish on dries. Hopefully there will be a few more successful days of fishing in 2012 before the curtain closes. Wednesday was forecast to be the last nice day until early the following week so I decided to once again take a fishing day. The flows on South Boulder Creek were back up to 107 cfs so I was tempted to give that nearby stream a try. Waterton Canyon was still running at depressingly low levels of 30 and I didn’t want to invest in the preparation and physical exertion required to bike up the canyon with flows that low. The Big Thompson flows were up to 75 and I tied tiny size 24 flies for the BWO hatch and hadn’t had a chance to deploy them there, so that became my destination. It was supposed to reach the low 80’s in Denver, and then a cold front was expected to move in and create a 20 degree plunge in temperatures. I decided to fish until the plunge arrived. I decided to drive downstream below the dam beyond the end of the special regulation water. I did this in the afternoon a year ago and had some reasonable success, and I felt this area was not as crowded as the catch and release water. I arrived at a nice wide pullout .5 miles downstream from the special regulation water and was in a position to fish by 9:30. I tied on one of the newly minted yellow Letort hoppers and added a beadhead hares ear beneath and began working my way upstream. The gradient was pretty steep so I performed quite a bit of rock climbing along the bank and moved from plunge pool to pool while I skipped cascades and rapids in between. I landed four trout in the first hour, but the action seemed quite slow in spite of this as I covered a lot of water and made many casts. In the second hour I broke off the beadhead hares ear and elected to convert to a salvation nymph as my dropper. The newly discovered productive fly really performed and I landed another 10 trout before breaking for lunch. I discovered that most of my catches were in narrow deep slots right next to the bank typically with tall grass growing and predominantly rainbows attacked the salvation on the lift. Unfortunately right before lunch another factor came into play in a major way and that was wind. Extremely strong gusts blasted down the canyon intermittently and I had to stoop into the wind, grasp my hat and hold my flies out to avoid getting toppled over. Unfortunately this wasn’t enough and a powerful sudden blast caught me by surprise which resulted in my losing footing and momentarily falling in some shallow water. Only a tiny amount of water trickled over my waders, and it wasn’t enough to cause me to quit or even discomfort, but the wind certainly took much of the fun out of fishing. It was nearly impossible to cast, and when I was able to execute a forward cast between gusts, accuracy was absent. After lunch the wind continued to howl and unfortunately the fishing slowed so I was really losing interest. From noon until 2:30 when I retired for the day I landed another four trout, but the amount of action did not compensate for the frustration of climbing rocks and battling the wind. Over the last hour I switched the salvation nymph for one of the new Craven soft hackle emergers that I tied the night before, and I managed to land a nice rainbow on the emerger, but that was the extent of its effectiveness. The wind literally blew me off the water. I landed 18 fish, and that was rather rewarding considering the conditions, but perhaps only one fish reached 12 inches. 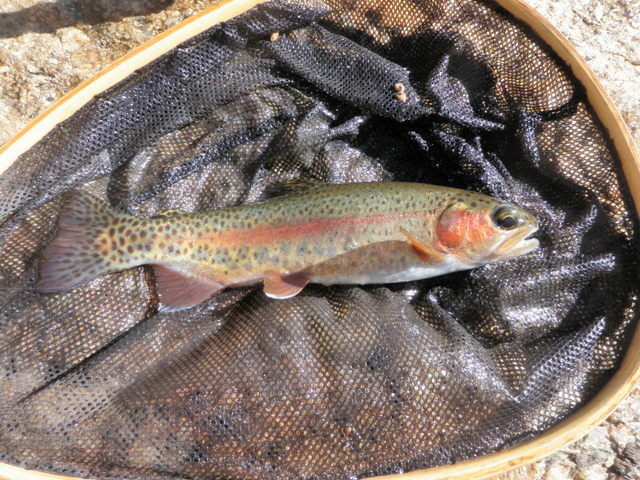 Perhaps two of my netted fish were browns and the remainder were rainbows. The rainbows were brightly colored but rarely extended beyond seven or eight inches, so that may have been another reason for my disappointment. As to the BWO hatch, I may have left before it occurred but I can’t imagine the tiny mayflies spending any time on the surface of the water with the strong gusts of wind present in the canyon. 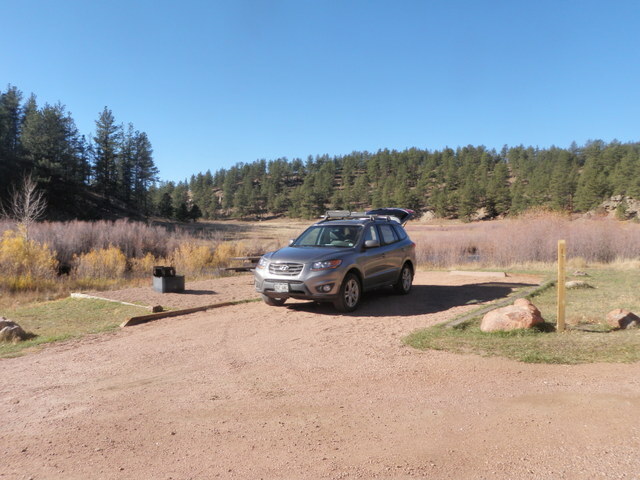 When I arrived back in Denver, Jane and I dropped off the Santa Fe for a 30,000 mile service appointment and the temperature did in fact plummet from 85 to 65 in the matter of 30 minutes. I was certainly glad I escaped the wind before the temperature took a dive as well. 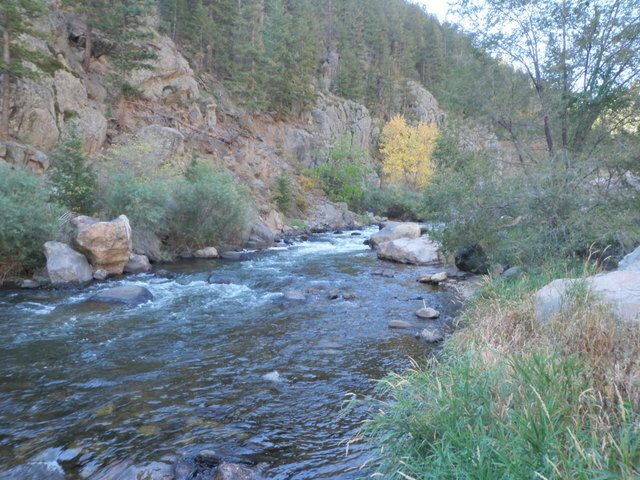 After a great day on Friday, September 28 I was anxious to return to the Arkansas River while the favorable weather continued. The forecast called for temperatures in the 70’s for the Arkansas River Valley near Salida, so I pushed my work off until Thursday and Friday when the temperatures were projected to plummet, and made the long trip to Salida. How would Tueday compare to Friday’s outstanding day? I arrived at the pullout below the county border at around 9:30, and once again it was quite chilly so I wore my Columbia long sleeve undershirt under my fishing shirt and added my raincoat as a windbreaker/outer layer. 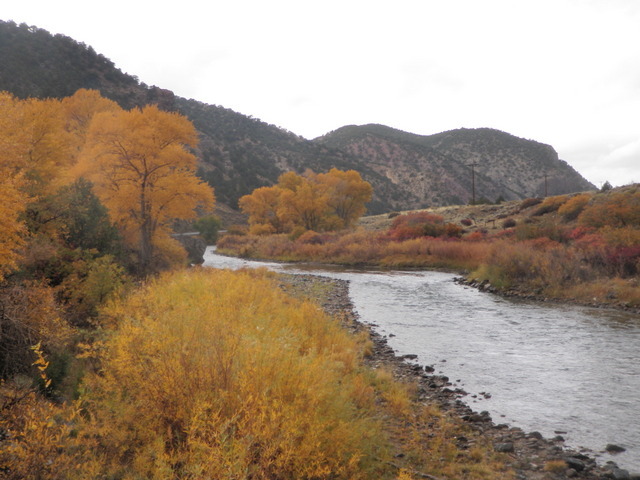 I stashed my lunch in my backpack and crossed the river at the shallow tail of the long pool straight below the car. Instead of hiking downstream as I had done on Friday, I climbed to the railroad tracks and walked west and then dropped down the steep bank to the head of the long pool. I tied five additional yellow Letort hoppers on Monday with full wings as these seem to float better than the ones I made with sparse wings. I put one on my line immediately and then attached a beadhead hares ear and began prospecting along the right bank and worked my way upstream. By noon I’d landed 11 trout mostly in the 9 – 11 inch range except for number nine and that was a nice chunky 13 inch brown and number eleven was a strong rainbow. Most of the fish went for the hares ear with perhaps one or two induced to rise to the hopper on the surface. After lunch I continued on my way and I began to notice a fairly dense swarm of midges hovering over the water with an occasional rise visible so I swapped the hares ear for a zebra midge and added a pair of decent fish on the size 22 midge larva imitation. Soon I began seeing a few BWO’s overlapping with the midges, so I switched the midge fly to a Craven beadhead soft hackle emerger. This fly became a hot producer and I was anticipating some great early afternoon action when I encountered a spin fisherman just above me. I chatted with the gentleman who told me that he and his wife had landed 52 trout so far on the day. He didn’t appear to be wading in the water very much so I continued fishing above him, but in short order he walked around me and waded across the river to his wife. He was a nice friendly fisherman, but I still wished he hadn’t disturbed the water. I probably should have rested the water and gone further upstream, but the area I’d reached was a great stretch with numerous riffles and runs of moderate depth and that was the sort of water producing fish. I remember noting that I was at 20 fish by this point, and as I cast to the top of one of the nice runs behind a rock, the hopper dipped and I set the hook and was attached to a hot fish. It immediately raced upstream to the left of the exposed rock and then paused a bit. Just as I began to apply pressure to gain line, the fish made a sudden move and accelerated further upstream. This move took me by surprise and the line popped and came flying back toward me. Both flies were gone and the line broke at the first surgeon’s knot that attached multiple sections of tippet to my tapered leader. I had three Craven soft hackles in my foam pad at the start of the day, and now two remained…one with a bead and one without. I replaced the hopper with another that I tied on Monday and then added my last remaining beaded Craven soft hackle. It didn’t take long after this rude interruption before I hooked a nice rainbow as I got a good look at it when it leaped from the river. Once again I was battling a hard fighter but this time I let it run and take line and didn’t try to rush the process. Guess what happened? I gave the rainbow too much latitude and it ran downstream next to an exposed boulder and once again my line separated from the fish. I reeled up the line and the hopper remained, but the beadhead soft hackle was gone. What should I do now? I wasn’t far from where I’d parked the Santa Fe so I considered wading across above my position, but I knew that I only had one remaining fly with a bead. Clearly I would need to tie some more of these effective flies when I returned to my fly tying desk, but that wasn’t going to help my current situation. I decided to try the soft hackle emerger without a bead by placing it as a dropper below a beadhead salvation nymph which would provide the extra weight. Perhaps this would actually work better if the BWO emergers were near the surface. This combination worked reasonably well as I landed another six small to medium size fish up until 3:30 with a few taking the hopper and the remainder chasing the soft hackle emerger; however, the beadhead version seemed to be more popular especially with larger fish. By 3:30 it had actually gotten fairly warm and I’d gone without action for a bit so I decided to try a black woolly bugger and worked some medium depth runs with no results, not even a bump or follow. Above these runs I encountered a nice deep pool and as I stood on some high rocks on the north bank I could observe four different fish hovering a foot below the surface and occasionally sipping something small from the surface film. They were closer to the opposite bank so I made some long casts with the woolly bugger and allowed it to sink and then made some erratic strips near the visible fish, but there was no reaction. Next I tied on a Chernobyl ant and delivered some across and downstream drifts; however, after ten casts I realized that I couldn’t avoid drag long enough for the fish to get a good look, so I clipped it off and rested the water while I observed. I decided that the only way to get a good drift over these fish was to cross below the pool and cast from the opposite side from below. I executed this move and began casting the Chernobyl upstream hoping that a large juicy attractor would induce a strike. Amazingly in the center run it aroused an eruption, but the fish turned away at the last instant. Again I rested the water and watched intently and observed a couple very subtle rises where the fish slowly came to the surface and sipped in something tiny. At the same time I saw a few sporadic BWO’s emerging so I replaced the Chernobyl with one of the size 24 CDC BWO’s that I tied for the Big Thompson. I moved upstream a bit to get better light on the lower part of the pool where the fish were active. As I prepared to make downstream drifts to the target fish, I gazed across the river and noticed 4-5 fish rising next to the bank just below where I’d been standing before crossing. I debated returning but didn’t want to risk another dicey crossing so I refocused on the fish in front of me. 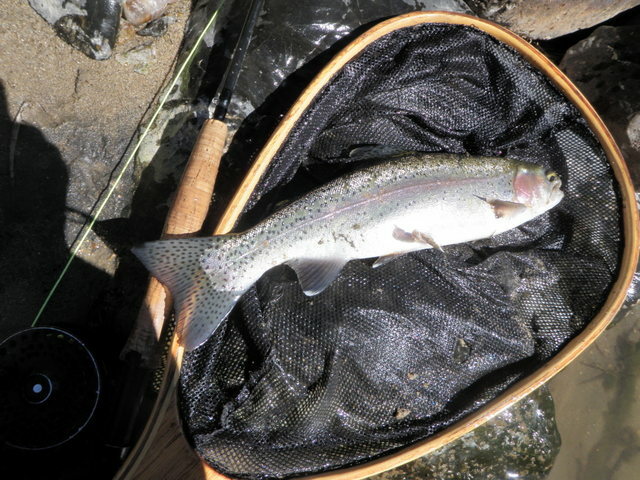 Finally after quite a few downstream drifts I enticed a 13 inch rainbow to rise in the center current and sip in my fly. I was quite pleased to succeed in landing one of the fish I’d observed. There was another deep pool 40 to 50 yards below my position but it had been occupied by a pair of fishermen when I passed on the opposite side, so I decided to explore that area for rising fish. Sure enough three or four fish were sipping in the eddy created by the huge protruding boulder above me. There was quite a bit of glare and riffle on the surface, and it was impossible for me to follow the size 24 fly, so I moved up tight against the large rock. This placed me above half of the pool, but more importantly I was above the area where the current fanned out and the fish were rising and the glare was eliminated. Once again I began making numerous drifts initiated by soft casts checked high to create a lot of slack and eventually another 13 inch rainbow tipped up its nose and sipped in my fly. On this note I called it a day and returned to the car for a three hour return trip. I landed more fish than Friday (28 vs 26) and only lost two decent fish to break offs vs. four on Friday, and I didn’t lose as many flies, but the average size of the fish was down considerably. For this reason, I would rank the Friday Arkansas River adventure above the Tuesday outing. 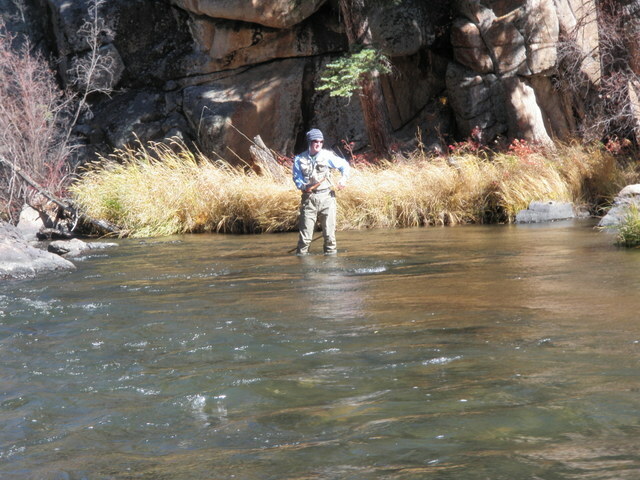 Will the weather provide me with one more trip to the Arkansas River in 2012?